What will you learn from this book?If you have an idea for a killer Android app, this book will help you build your first working application in a jiffy. You’ll learn hands-on how to structure your app, design interfaces, create a database, make your app work on various smartphones and tablets, and much more. It’s like having an experienced Android developer sitting right next to you! 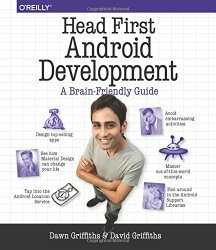 All you need is some Java know-how to get started.Why does this book look so different?Based on the latest research in cognitive science and learning theory, Head First Android Development uses a visually rich format to engage your mind, rather than a text-heavy approach that puts you to sleep. Why waste your time struggling with new concepts? This multi-sensory learning experience is designed for the way your brain really works.